It’s been a long time since I’ve looked at the credit card market. While I was never once the type to churn a bunch of credit cards, for a period of time during the college years – I was one of those guys that dabbled in 0% balance transfer cards. Thinking back, my time spent probably would have been more productive if I had applied it towards school or business – but alas, you have a different mindset when you’re in your late teens or early 20’s. These days, because my credit cards are all essentially all on auto pilots, I hardly ever log-on to check the account unless I spot in my email an Amex offer I should add to the card, or a Chase reminder that a new 5% spending cycle is about to commence. After logging into American Express due to one such prompt, I was surprised when I was faced with a $1,600 cash-back balance. Uhhh that’s a lot of cash back just sitting there. Thinking I just found a big wad of cash under the proverbial sofa, I quickly went to claim my new found fortune. Bad news: Blue Cash from American Express no longer lets you request a cash-back checks. All “cash-back” are now requested via a statement credit method only. And thus this $1,600 will simply get stuffed back into the next billing cycle. Of course, the idea is the same. There’s an extra $1,600 laying around that I didn’t factor into our budget. But there’s something different about having that cold hard cash (or uh, check) in you hands. Since my current balance with this credit card is zero, I’m not quite sure if American Express will wait for the balance to start incurring and then debit/credit accordingly. If I’m lucky, perhaps American Express will just refund the excessive credit in the account to me in the form of a check. Finding the “random” $1,600 got me thinking. Do I have a bunch of other points sitting at some other accounts doing absolutely nothing? 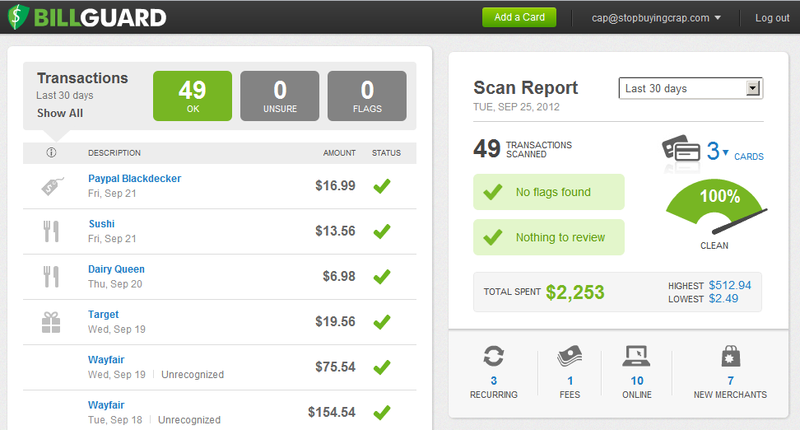 Over at Chase Freedom, I have a combined points of 41,985. That’s good for $419 in cash back! (Of course, redeeming Chase Freedom points for cash is apparently the stupid thing to do these days. They are apparently valued at less than a penny per point, whereas if you transfer to miles, they are worth around 1.6 cents per point). There’s great guide here from Well Traveled Mile on transfer ratio, which card transfers to which partner airlines and all that jazz. Warning: it can be confusing as heck if you don’t care to dive into the world of rewards travel credit card. The essential gist is that if you simply request cash-back, you are losing out on maximizing your credit card points value. Its probably clear at this point that our household primarily use an American Express card and a Chase Freedom card for our spending needs. But with these points and cash back just sitting there building up without being utilized or maximized – I realized that it was probably a good time to shop for a new credit card. I don’t think we want to juggle 5 different cards in our wallet, but the Blue Cash has long lost its luster, and the Chase Freedom has plenty more competitors these days. During the time frame since I’ve opened the Blue Cash card (probably 13 years ago?) – the card has consistently reduced its program benefits through the years. While I was grandfathered in for a period of time, it seems about 3-4 years ago American Express has significantly cut back on the cash-back % the card was offering. At a time, you can easily reach the 1.25% cash-back threshold, and these days there are now caps and limits to the cash-back. 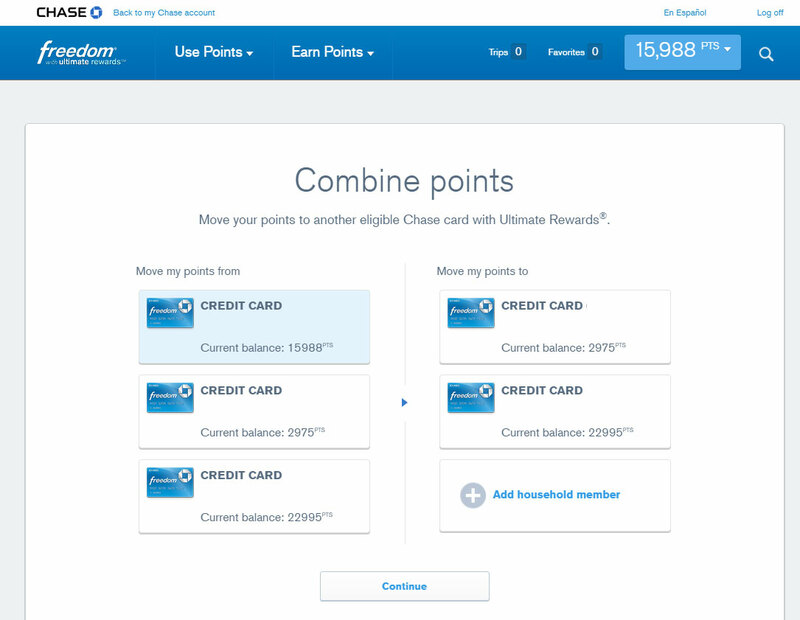 For the Chase Freedom, the points are okay and the rotating 5% category is now an industry norm (there is a similar Discover product these days) – and the increased points/cash-back are nice – but with our spending pattern and threshold, we can easily earn more rewards if we simply shop for a card that fits our spending more closely. Now that our daughter is 4 years-old, we’re expecting more travel in the foreseeable future as we try to squeeze in a few family trip per year. Heck, we were probably traveling way too much with the toddler/baby in tow in the past few years. My daughter has already taken over half a dozen international flights in the past few years – and these were travels out of necessity – so they’re never as fun as traveling for leisure. Because of this, I have been looking into travel cards a bit more – and it seems the de facto travel card to get these days is the Chase Sapphire Preferred (or Reserved if you’re baller enough). Everywhere you look, it is one of the top pick recommendations as the card can generously transfer earned points to many airline programs at generous ratio. While the card comes with fees, as long as you do the math – you should be able to easily reap many more benefits out of the card than the fees that comes with the card. There’s a bit more work involved when you opt for a travel card, but like free food – a free trip or airline ticket is the next best thing. So, where should you go hunting for a new card? There are a myriad amount of tools these days. A quick Google search will bring up walls of tools, comparison site, blogs, etc. (its good money to refer customers to the credit card company, after all). If you prefer, and this is often my preference – I enjoy reading about usage scenario straight from actual cardholders. A search on reddit’s personal finance subreddit will show you many opinion and helpful viewpoints. Most of the sites and tools you’ll find online will be plenty helpful, but I would strongly suggest avoiding signing up for a credit card immediately from a written blog post, or tools with “editor picks” that may have ranking influenced by credit card commission payouts. Depending on the article you’re reading, some of the benefits/perks for the card written about may be long gone – and while card issuers are a lot more strict on partner sites promoting credit cards, people are only human and mistakes do happen. Before you shop for a new card, sites such as Credit Karma and Credit Sesame are always helpful in determining where your credit stands before you apply. Many of the best reward cards are fairly stringent and credit score/history requirements are quite high. Interestingly enough, FICO Score also appears to be free and in abundance these days, as its now offered as a free benefit to many major credit card, checking, or savings account. So you can always go that route too, to see where your score situates. Having a Baby? Great. $13,000, Please. How much is that bundle of joy going to cost you? There are lots of online calculators out there, but a quick search will yield this estimator at Babycenter.com. The calculations are based on USDA’s 2010 report, wherein they take account of the region you live in, your annual income, and the type of schooling your child will eventually attend (big factor here). After spitting in my info, the calculator tells me I’ll be spending $13,000 this year. Having said that, after the wife and I ran through the numbers from the past few months, we’ll definitely be more financially conscious with our next baby (if there’s to be a next one). So despite the fact that the numbers above may be a bit off (given the fact that you’re probably paying for housing and transportation of some sort already), they are still good ballpark numbers to think about given that people tend to move into larger homes when the family size increases. I started writing this post near the end of 2012, the annual cost went up from $12,000 to $13,000, whereas the final bill jumped by $10,000 to $333,280 vs. the previous $321,140 estimated in 2012. Yep, inflation can be crazy. Er… I don’t have $333,280 sitting in the bank. Well, not quite. I suppose if I sold the house we’ll have more than enough, but the life of a vagabond with a 6-month-old probably won’t be approved by the wife. Now obviously I can tell my daughter to shove-off 19 years later when she begs me (or the wife) for some cash — or hopefully we’ve raised her well and she would have figured out some sensible method to attend her trip (and avoid being TAKEN), but regardless of this made-up scenario, it is highly unlikely you’ll stop supporting your child financially some way or another after they’ve turned 18. Based on my own personal free-loading experience on my parents, it is more likely that you’ll be offering financial assistance to your adult child until they’ve settled into a secured job or maybe even until they’ve started raising their own family. In fact, a post I wrote way back in 2008 on “freeloading family members” showcased the very problem of an adult child (or other relatives) overstaying their welcome (some of the comments in that thread, all the way up to as recently as this week can be a difficult read). #1 The co-pays. Perhaps your health insurance doesn’t cover office visit beyond preventive care. Worst, you may have expensive co-pays even for preventive care (though that’s probably rare). According to the Mayo Clinic, most babies have up to SEVEN colds within the first year of their life! The numbers gets decidedly higher if the child is at daycare or comes into frequent contact with other babies and toddlers. $10 here, $20 there. It adds up. Sure, you don’t need to visit the doctor every time little Timmy is coughing, but tell that to the worrisome first-time parents and you’d probably receive a nice cold death stare. #2 The unexpected formula baby. You’ve planned to breastfeed Timmy since day five of conception and you’ve heard horror stories of initial breastfeeding experience (all true), but you’re determined to stick it out and get that special extra bonding time. And then it happens. Maybe you got really sick. Or work got busy. Or even though the breastfeeding class says EVERY mother will produce milk but you’re just in that 1% clause. Whatever the reason, you switched to formula feeding and suddenly you’re paying an extra $1,100 to $1,700 per year (amount depends on the baby, formula of choice etc). #3 The lack of hand-me-downs or family support. Perhaps you’ve moved to a new city or your family doesn’t live nearby. Or heck, maybe you’re one of the first in a small family with a newborn. Regardless, babies can grow stupidly fast and the cost basic things such as clothing can get quickly out of hand. I’m fairly certain my daughter has outfits that cost more than what I’m wearing right now (to be fair I often write blog posts in boxers only… hey, enjoy that imaginary for those that have met me). The lack of family support, whether via hand-me-downs or an extra person being around to help you watch the kid can really add up in cost. If the kid’s grandparents aren’t available or in the vicinity, what do you do when maternity leave is over for both parents? I’ve talked to quite a few fellow parents recently and the topic of daycare cost vs. returning to the workforce is always a tricky situation. 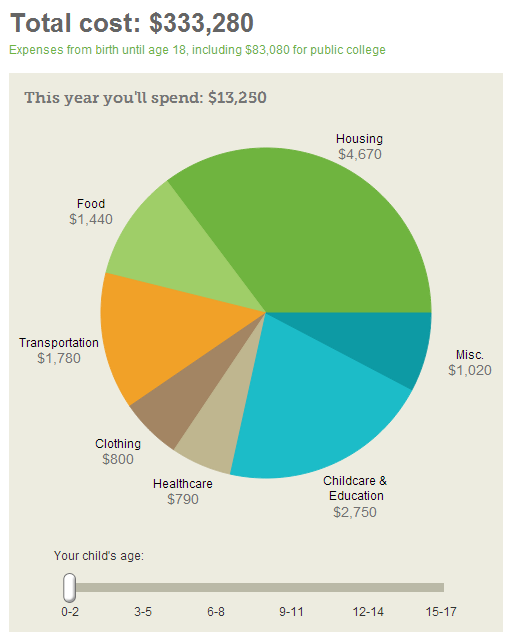 On one hand, you’ll be increasing household income, but on the other hand, daycare can get mighty expensive. There’s obviously been plenty of books written on the cost associating with having a baby and raising a child, and probably plenty of book with tips on saving money while raising a child too. The only solid thing I can say with confidence is that you can never really give an exact number to the cost of raising a child. I’ve been getting gas at my local Costco ever since the wife and I moved in the area 8 months ago — its not always the cheapest in the area, but given Costco is only 5 minutes away from the house and the line isn’t too terribly crazy, its my usual prefer choice to get gas (I’m probably using it more to justify the Costco membership too). A quick Google search shows that the authorization amount of $150 has been around since mid-2012, so that added even more to my surprise and made me feel a little bit out-of-touch. For those that aren’t aware, preauthorization hold at gas station is pretty much standard practice, but it doesn’t seem like it was too long ago when the holds were only $50 at most. Somewhere along the way, they have quickly eclipsed $100 and became $150. Now, a temporary $150 hold isn’t a big deal, given after a day or two the actual amount you’ve pumped will quickly replace the pending transaction showing up in your online account (so don’t worry if you think you’re being scammed by Costco or some such). Unless you’re driving a gas guzzler and gasoline is ridiculously priced in your area, you’re most likely paying well under $80 per full tank of gas. The problem with these high authorization hold though is that sooner or later, using gift cards at the gas pump will no longer be an option. If your American Express gift card (or at other gas station, Visa/MasterCard) is under the authorization hold amount, the card will get a nice quick decline when you tried to swipe it at the pump. Those with low credit limit on their credit card will have to also be mindful of their current available credit limit before they use their credit cards at the pump ($500 credit limit for students, those with no-credit aren’t too uncommon). Hopefully the trend of high authorization hold will taper off, but given the ever rising cost of fuel prices, the outlook isn’t so good. This is probably a lot lower than most household as I work from home (the lack of a commute can be a real money saver). In comparison, for 2012 the average U.S. household was spending around $242 per month on gas, or $2,912 annually, according to latest report from the Energy Information Administration. At 4% of the mean household income (before taxes), its of little wonder we’re seeing more and more gas friendly vehicles on the market. But in all seriousness, one of the main reasons why I frequent conferences such as Finovate and FinCon is to keep an eye out for innovative and interesting financial tools and startups — to which BillGuard.com is one such nifty web app. While hanging out with Jim and Jeremy, we got a brief wind of BillGuard from its CMO, Mary Anne Keegan, and before she can gave us the full pitch, one of us pulled up the site on our smartphone and immediately thought the whole premise was in fact pretty neat. 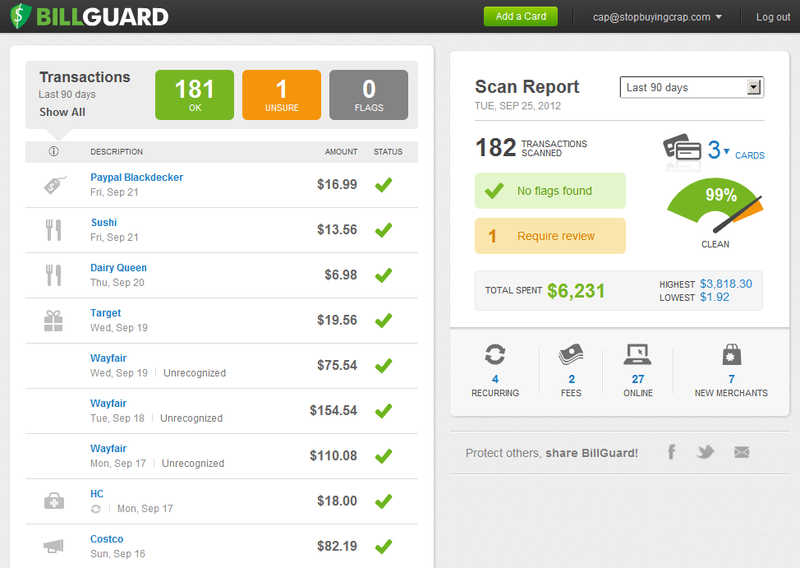 BillGuard pitches itself as a service that finds bad charges on your bill and help you get your money back. The service is pretty straightforward in its promise. For anyone out there that ever had to call customer service after discovering a charge on their bill from THREE months ago, you’ll know how helpful and stress-relieving the whole process would be if the bad charge was caught earlier, before it gets charged again and again, month after month. BillGuard catches bad charges on your bill by analyzing millions of customer billing complaints (crowdsourcing) in order to find deceptive, errorneous and fraudulent charges on your credit and debit card bills. A good example of this would be if everyone and their mom flags “NIGERIASHIPPING.COM” as a potential fraudulent transaction, if BillGuard scans your bill and see this transaction (or variants of it) on your bill, they will flag it and alert you. The best part though is if you’re dead sure the transaction is a bad one, BillGuard helps you with the dispute process, saving you some time and headache. BillGuard is currently free to signup, with up to 3 cards protected for the free plan, and up to 10 cards protected for the “Family plan” which runs $79 a year. Given the free price tag, you really don’t have much to lose to give the service a whirl, provided you’re comfortable with handing your credit card login credential to a third-party web application. The good news is that BillGuard’s data comes to them via Yodlee, a well-known data aggregation platform that is in used by over 600 leading financial institution, and of course comes with bank-level security. Data is also read-only, meaning that what BillGuard access can only be used to scan and analyze your transaction to find bad charges — even if your BillGuard login is somehow compromised, the unscrupulous person wouldn’t be able to transfer money or make any changes to your financial account. The sign-up process is pretty darn straight forward. You put in an email address you’d like to use to sign-up and choose your password. Once the account is created, you can add the credit/debit card account of your choice (screenshot above). For those with multiple credit cards from a single issuer, you can select the specific card you’d like BillGuard to scan vs the defunct one you rarely use (e.g., you use your Costco Amex card more than your Amex Blue card). For my review, I picked my more frequently used cards: my Delta Amex Card, Chase Freedom Card, and finally the good old classic Amex Blue Cash. Once logged in, BillGuard immediately gets to work, scanning your previous transaction and organizing them in a fairly visually appealing format. The user interface, as you can see from the first screenshot above, is clean and concise. Even if you’re not a savvy web user it should be easy to identify and absorb information. One reason why BillGuard immediately caught my eye on initial impression is how simple (and helpful) the proposition is. The service is especially appealing to people like me, who make about 90% of their transaction on a credit/debit card. I simply don’t carry a lot of cash, especially due to my Schwab checking account refunding ATM fees — plus, its nice to get the occasional credit card perks such as cash back, or miles for that first-class ticket to a Euro vacation (but not on Delta Air Lines). The problem with charging 90% of your transaction on credit/debit is that things can get a bit hectic at the end of the month if you review your bill for any errors (because errors do happen, and to be honest your bank isn’t going to proactively help you find bad charges from nefarious merchants). As you can see below from my screenshot, I’ve had over 182 transactions in the past 90 days (Cap, you buy too much crap). This comes out to an average of 60 transactions per month — quite a bit of charges to remember and keep in mind. With BillGuard, you can immediately skim some of the latest charges for potential hiccups. 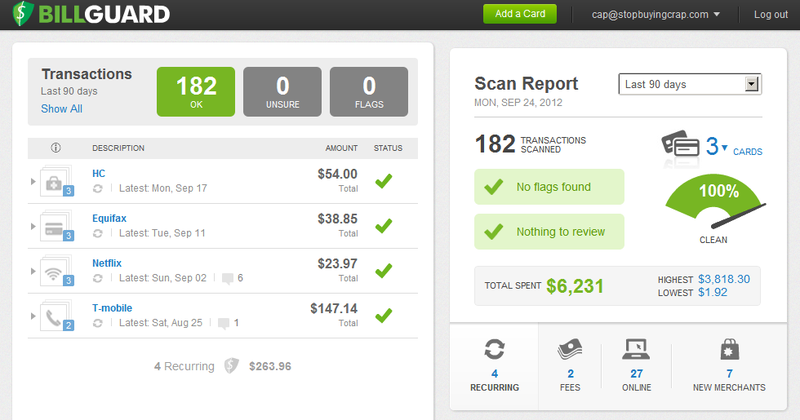 On my initial scan, BillGuard flagged a transaction called “Pho Lu” as an “unsure” charge. Mainly because this isn’t something in their database yet. For those quick with their Google-fu (or well versed with Vietnamese noodle soup), you’ll know that this is an Asian noodle joint in Southern California. I suspect as more people in my area uses BillGuard, the merchant categorization will get more rounded-out and the less popular merchants will be identified more precisely. Another not-quite-as-well advertised functionality of BillGuard is “transaction search,” which lets you look up some of the more questionable transactions & merchants out there. Unsurprisingly, you’ll see lots of complaints on credit score charges or various fees — and funny enough, lots of complaint on unknown World of Warcraft charges. Another helpful portion in BillGuard is the immediate ability to see your recurring charges, potential fees from your bank, and new merchants that you recently frequent (so even if its flagged as OKAY, you can double check later to see if all is peachy). Paypal Blackdecker – Bought a refurbished handheld vacuum cleaner for $17. 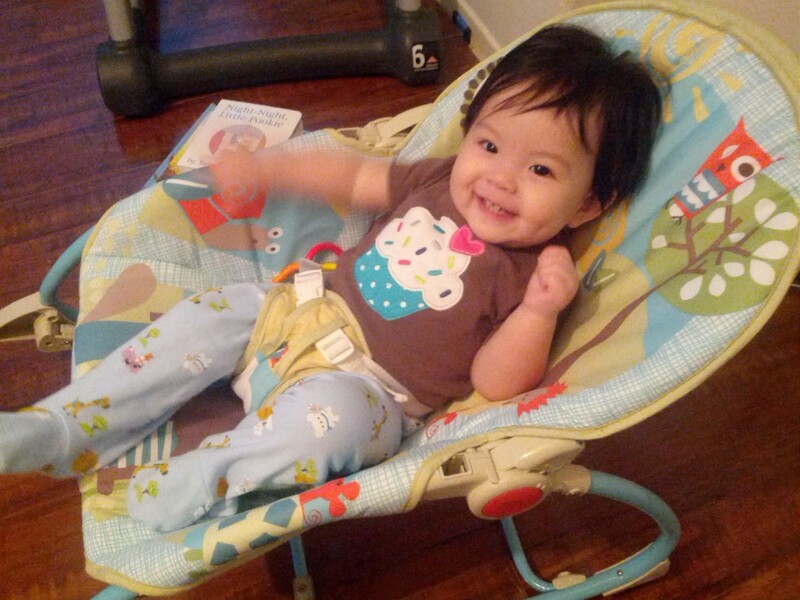 Wayfair – New crib, mattress for the kiddo at Wayfair, my new favorite online shop. Walmart – Funny that I don’t visit enough that this got flagged as new merchant. Cox Orange – Internet bill. AT&T DSL is so much cheaper but oh-so-unreliable. Gamefly Digital – Guild Wars 2 for the wife. No joke. Vons – Didn’t have a Vons in my previous location so this came up as new. Hyatt Hotels Denver – For my recent aforementioned FinCon12 trip. All-in-all I find the service to be pretty impressive and useful and the free price-tag is icing on the cake. Having said that, there are definitely some people who might not find BillGuard attractive what-so-ever. You charge most of your transaction on your credit/debit cards. You’re adverse to online banking, let alone giving your login to another website other than your bank. Some people just aren’t comfortable with this aspect, even if no transactions can be made via their bank’s credit card login information. And to be honest that’s okay. You shouldn’t use a service you’re not comfortable using. For those who live & breath their daily transactions on credit/debit cards, BillGuard will seem like a no-brainer service that should have been available years ago. While some current PFMs do offer part of the features (e.g. notifying you when you have a fee on your account), crowdsourcing merchants and transactions goes a long way in identifying fraud (and scales much better). If the service hits a certain critical mass, I suspect its data will be fairly robust and the transaction dispute process will be even more painless (how awesome would it be if you can solve a dispute and get your money back within 24 hours?). While the service is US-only so far, its potential is pretty big for markets such as Europe and Japan, where mobile payments / NFC transactions are already populating in abundance, and consumers are already comfortable with moving to a cashless system. As the US eventually plays catch up (or maybe not, I still personally like to spend cash at small mom and pops even though I’m a credit lover), I can see how services like BillGuard may come built-in to your bank logins or third-party banking apps. BillGuard seems to be gravitating towards the mobile market too as they just released their service for Passbook in iOS 6. They will most likely have an Android/iOS app version soon, though the web app worked fine enough on my iPad and Galaxy Nexus. At the end of it all, its a good time for financial nerds and OCD personal finance people such as myself. We now have much more tools at our disposal — not only to help us figure out our financial life, but also keep a safe watch over our financial nest eggs. Personally for me, even if the fraudulent charge is some measly $5 charge, if I can dispute it in a painless and non-time-wasting manner, then I’m one happier camper. If you think this review was handy, keep an eye-out for some more financial startup/tools I’ve been meaning to review through the years: SaveUp.com, ReadyForZero, FutureAdvisor, Betterment, and you’ve probably already heard of CreditKarma and CreditSesame. 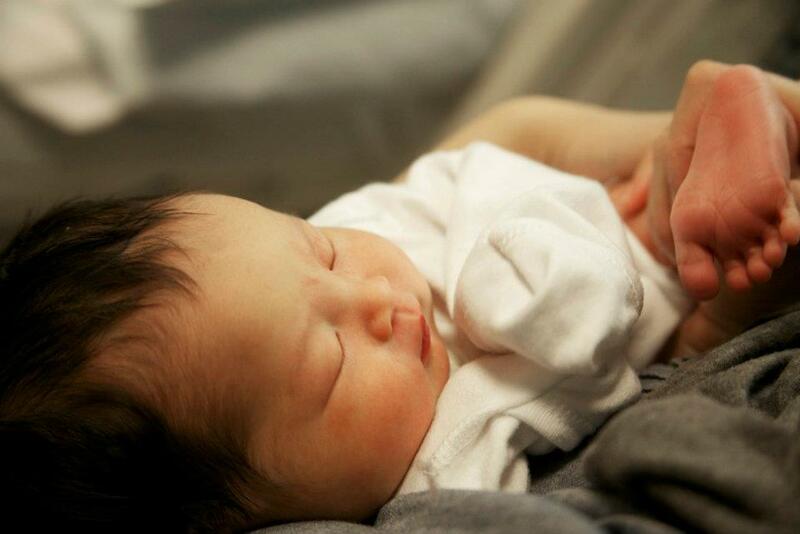 My wife gave birth to our healthy baby daughter. The funny part was we were wholly unprepared for having our daughter on that particular day (but lets face it, estimates are estimates). On that Tuesday morning, we were at the doctor’s office for my wife’s weekly checkup (she was already estimated to due a week ago), when the doctor handed us the admittance order to the hospital. This probably isn’t the most novel observation in the world, but it would certainly seem that a great many people get “tricked” into spending more than they normally would by the lure of coupons and discounts (cue Captain Obvious). These “fake-ish” coupons and deals come from everywhere: newspaper clippings, TV and radio offers, Internet promotions, fliers, smartphone apps. We are inundated in the idea of saving money—from piggy bank iconography in our childhood to the very real need to save for retirement as we grow older. If there’s the word “save” and the dotted line around a box, it feels and looks like savings. But are you really saving money if you’re spending it? That seems to be a paradox. The money you just spent is not actually still in your pocket, contrary to what many advertisers would have you believe (you might remember common advertisements slogans such as “spend more, save more!”). But beyond just a general distaste from deceptive advertising, what can we learn from those pesky “coupons and discounts” that actually burn holes in our pockets? So its April 17th and you’re doing your taxes the very last minute. Good news, you just got an email or text from Intuit saying your e-file was REJECTED. I just experienced this problem over the weekend and the annoying part was that neither TurboTax nor IRS has very clear instruction on this particular situation. I used the AGI method to verify my e-file identity. I have my exact 2010 1040 tax return on the table and I’m reading line 37 correctly, I even double checked if there was a fat finger mistake but still the e-file return was rejected, what gives? Last week, I went to my local mall for the first time in many months (or was it years?). As I strolled around, taking in the sights and the bustle of our consumerist Mecca, I couldn’t help but notice all the sales I saw advertised at every major clothing retailer. JCrew and Anthropologie had multiple racks with deeply discounted items. Brooks Brothers and Macy’s had a 40% and 25% sale on every piece of clothing in the store, respectively (yes this is exactly how I shop, I take notes of discounts for future blog post that will never be written). The more I walked the more I realized that there were considerable “sales” all around me. But the widespread nature of the sales does not mean that all clothing items were reduced or that customers were bound to walk away with discounted purchases without exerting too much effort. In fact, it was the contrary. Although stores were quick to advertise their sales in posters and entranceway signage, an actual examination of these stores revealed that there were still plenty of items priced just as high as ever. The differences between a full and half-priced item seemed to be minimal and random. In some stores, all lingerie was heavily discounted while jackets remained at full price. In others, some jackets would be surprisingly cheap while others were shockingly expensive. The funny thing is that there’s some real science behind the arrangement of stores, from packaging, visual of placements, to eye tracking technology, even if it all seems maddening random and chaotic at times. Of course, sometimes you come across weird gaps in thinking at certain stores. At Gap, for example, the price for a pair of blue jeans ranged from $9.99 (on sale) to $170 (full price). The two pairs of jeans at the edges of this spectrum both looked nice, both fit well, and both were labeled with relatively reputable brands. But there was a full $160 difference between the two. Pretty ridiculous. I personally wouldn’t cough up $170 for a pair of jeans – especially if a similar $10 pair could be found only several racks down. If someone frequently buys their clothes at this pacing, they’ll probably need a title loan to cover that difference. This is all to say that the frugal shopper really has little reason to buy items at full price these days, because there’s always a “sales” around the corner or a 50% off sign somewhere, and the problem is that a good number of times, these sales signs are a mix-bag in terms of savings. The fact is, as long as you plan ahead (and are willing to buy winter clothes during the spring), willing to buy online, don’t need to own the absolute latest styles, and have some flexibility with your purchase preferences (i.e., you don’t leave for the mall thinking “I must get a red suit jacket today”), then there is no reason why you shouldn’t be able to focus on the actual savings and ignore the “sales” that are meant to play with your mind. Are Sale Signs Less Effective When More Products Have Them?